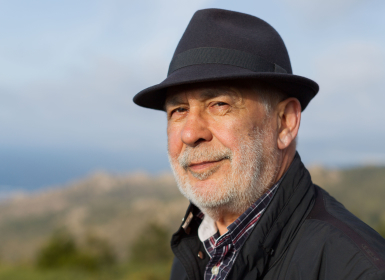 Xabier P. DoCampo is one of Galicia’s most distinguished writers. As a schoolteacher, he has been heavily involved in movements of educational reform in Galicia. He has also contributed greatly, in libraries and other settings, to the promotion of reading. He has worked as an actor and scriptwriter. But he is best known for his works of fiction aimed at younger readers, of which there are more than thirty. These have been included in the IBBY Honour List and the White Ravens Catalogue. In 1995 he won the Spanish National Prize for Literature with When There’s a Knock on the Door at Night. His novel The Book of Imaginary Journeys, illustrated by Xosé Cobas, takes its inspiration from Italo Calvino’s Invisible Cities. The Book of Imaginary Journeys (224 pages) comprises two travel journals written by a certain X.B.R., in the first of which the Traveller describes the cities and kingdoms he visits. This makes up thirty short texts. The second journal contains notes and drawings the Traveller jots down along the way, together with more intimate reflections. These drawings and reflections are interspersed between the more descriptive texts. The book is inspired by Italo Calvino’s novel Invisible Cities.